After shopping for nearly half an hour and ready to head home, I pushed my buggy to the bread aisle for my last and very favorite Costco item, the rosemary olive oil bakery bread. I keep this bread in my freezer at all times; my family loves it. When I saw a huge empty space on the bread table, I was hugely disappointed to find that the rosemary bread was completely gone. Wiped out. I asked the bakery worker, who said it was all sold earlier in the day. I couldn’t believe I was going to leave without my favorite bread. 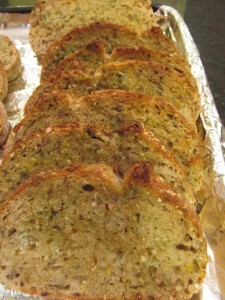 “I got the whole wheat loaf and made a dipping sauce out of olive oil, Kirkland pesto, and this new Costco seasoning. It was unreal. Not a piece left:-). 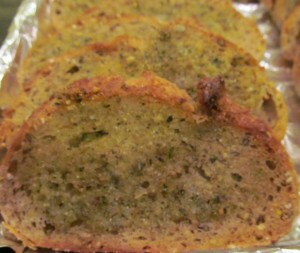 So, heeding Leigh Ann’s advice, I bought the Costco whole wheat loaves and the Johnny’s Great Caesar Garlic Spread and made garlic bread that very night. (I didn’t use the pesto but am sure it would taste great also). The bread was unreal. The texture was wonderful, with a slightly crispy/chewy crust and soft, seed-laced insides. 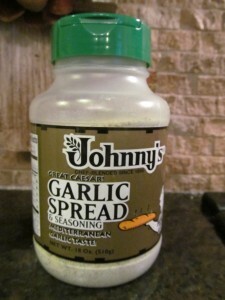 The garlic spread mixture gave it the most unbelievably buttery, garlicky flavor I’ve ever tasted on garlic bread. This is very different from the rosemary olive oil bread. It is just as delicious but with a different flavor. I could be happy with either bread and will keep both in the freezer to have on hand. These breads go great with everything from soups to pasta dishes to fish or chicken, and they would make wonderful hot sandwiches. Here is how I made the bread; it couldn’t be more simple or more delicious! Mix softened butter, EVOO, and garlic spread. Slice bread (I do fairly thin slices), and spread mixture on sides. Bake in oven on 350 degrees for 10 minutes.